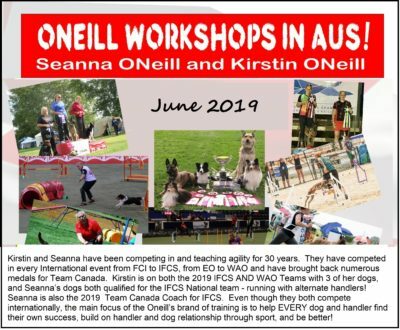 A variety of agility workshops will be held the weekend of June 1-2, and the weekend of June 8-9, 2019. Enter on-line via the form below. The prices are in Canadian dollars and will be discounted as follows. Not sold on-line. Click here to request one. Not sold on-line. Click here to request one. Your discounts will be applied to the final price at the bottom of the page, after you click “Add to Cart”. The discount is per handler. If the same handler desires to register more than one dog, add them all by repeatedly returning to this page to use “Add to Cart” and get them all in a single order. Make sure to spell the handler name the same, each time. This will cause the discount to be recognized in full. And then you can proceed to checkout and pay. Click here for the workshop descriptions. Click here for a calendar view. Note: you won't be able to choose two workshops in the same time slot. Your discounts, if applicable, will be applied to the final price at the bottom of the page, after you click “Add to Cart”. fundamentals of how, when and where to use them. course analysis and why different crosses/handling maneuvers will give different results. manouveurs to help your dog set up for a line can be critical to your success on course. Want to learn about playing Disc with your dog? Have a started dog and want to improve your skills? This workshop will focus on beginner and intermediate level disc dogs and cover Basic Throwing, Trick Throws, Catching, Disc Tricks, and Putting a Basic Freestyle Together. Jumps are the most common obstacle and often the least time is spent training the dog how to best navigate them. course. For dogs over 6 months and all levels. Working with Cones. Start your dog on the right path! starting training or retraining the Frame and/or Dogwalk. and how to train them. 6 months and all levels. Introducing fast paced competition and fun games can help increase drive / focus and fun. with the dogs! For dogs of all ages who are comfortable with jumps and tunnels and are able to work off leash! 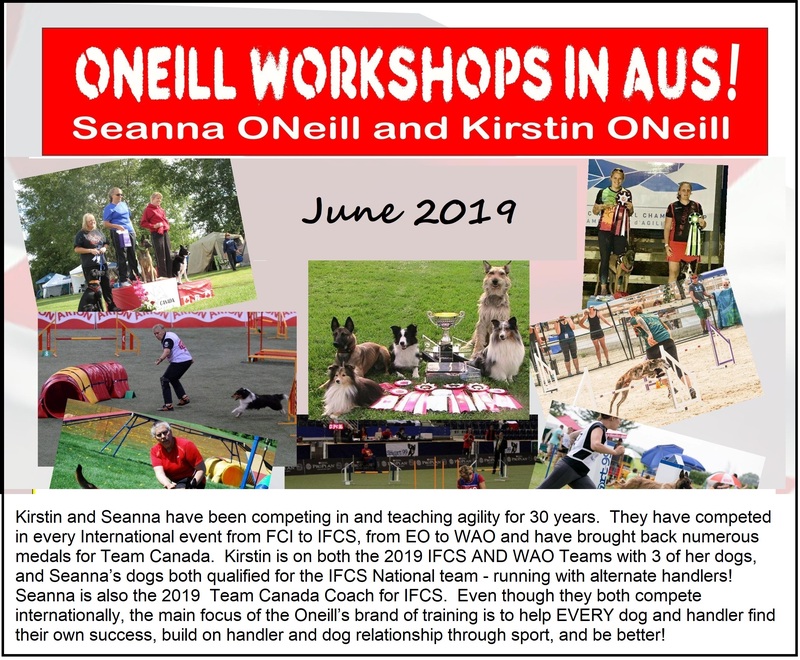 Is your young dog having fun in the sport? Could they be faster? introduce various fun demonstration games and have fun playing with the dogs! For dogs of all ages who are comfortable with jumps and tunnels but not ready for a social off leash setting. Book a Body Work Session for your dog with Kirstin ONeill. Not sold on-line. Click here to request one. Book a Private one on one coaching session for you and your dog with Kirstin ONeill. months who have an understanding of Frame and Dogwalk. increase speed and decrease bar knocking. and increasing speed/independence/confidence on these pieces of equipment. the dog from the rear when you get caught behind. For handlers with dogs who do not wait for them on course, or who have to wait for them on course!